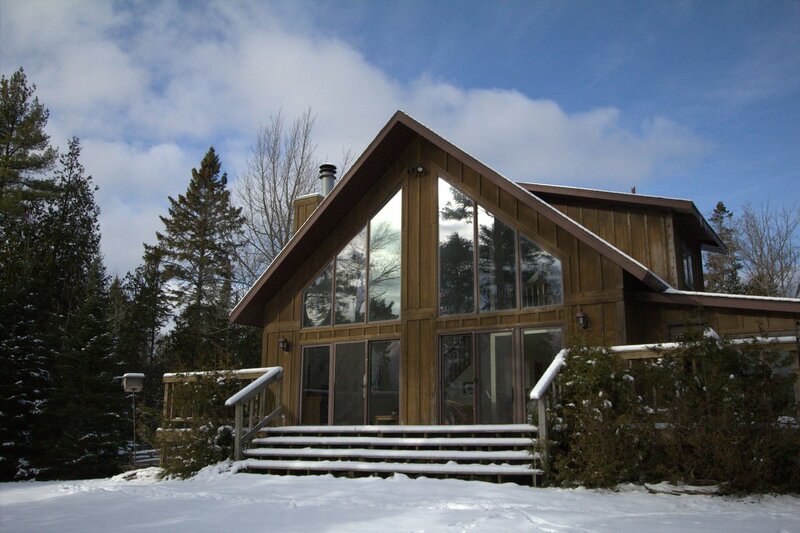 NORTH SHORE RETREAT (Manistique): Along the Lake Michigan Shoreline. Fenced yard for your pet, 10 private acres. THIS COTTAGE HAS VIDEO MONITORING. Inside video monitoring CAN be disabled upon arrival. Outside video monitoring CAN NOT be disabled. 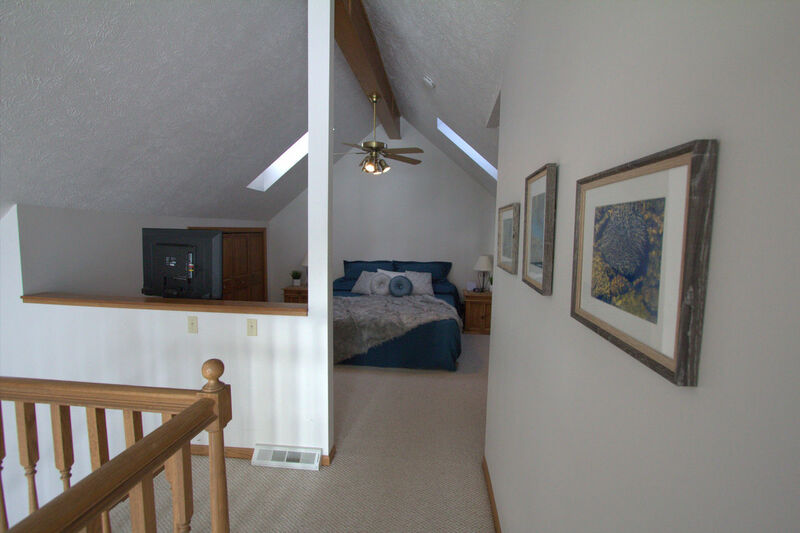 BEDROOMS: 1 King open master loft suite with incredible view of Lake Michigan. 1 main level BR with queen bed & a twin bunk bed. 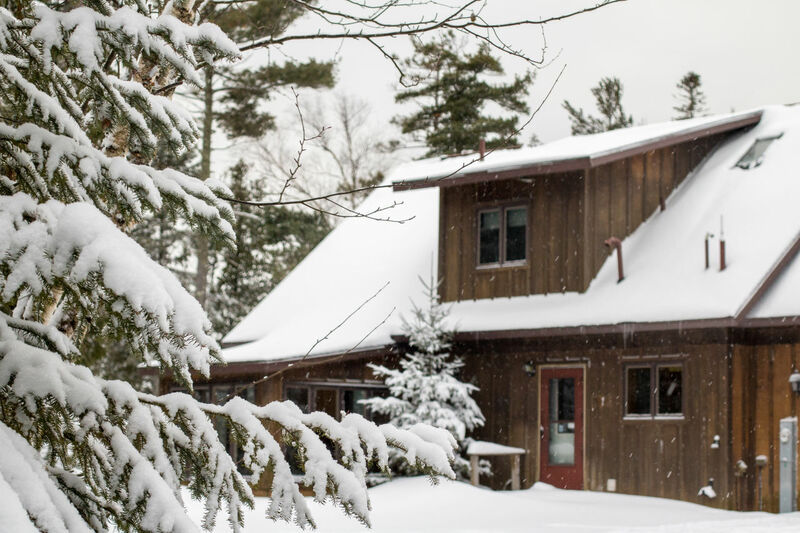 Spend a few peaceful days at North Shore Retreat and you’ll understand why we say, “Inspiration Lives Here.” Whether you’re writing, painting, birdwatching, spending time with family, or just getting away from it all, we’re confident you’ll find yourself refreshed and inspired by the natural beauty of the northern shore of Lake Michigan and the comfortable surroundings of this home located on the waterfront in the south central Upper Peninsula region. 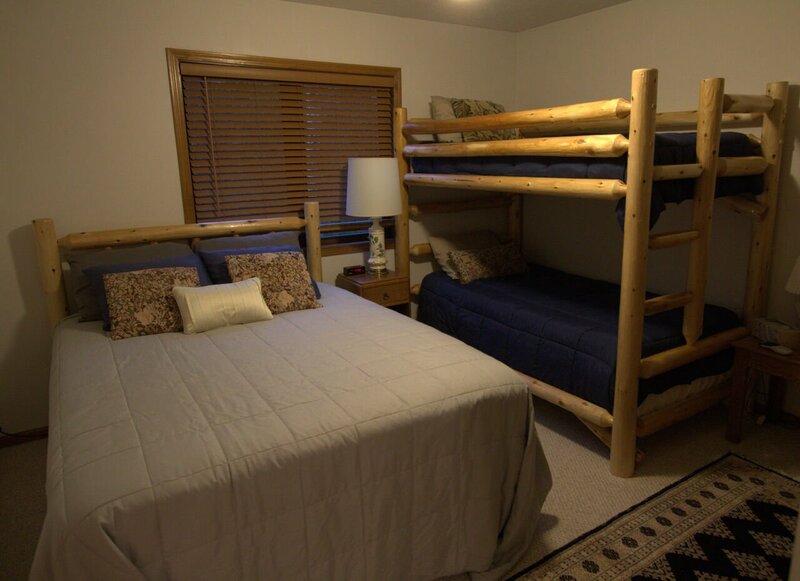 North Shore Retreat offers guests a main floor bedroom with 1 queen size bed & 1 twin size bunk bed and a large upper level open master loft with a comfortable king size bed, full bath, and plenty of closet space. Enjoy stunning views of the waterfront right from the bed and fall asleep gazing at the stars through the two overhead skylights. 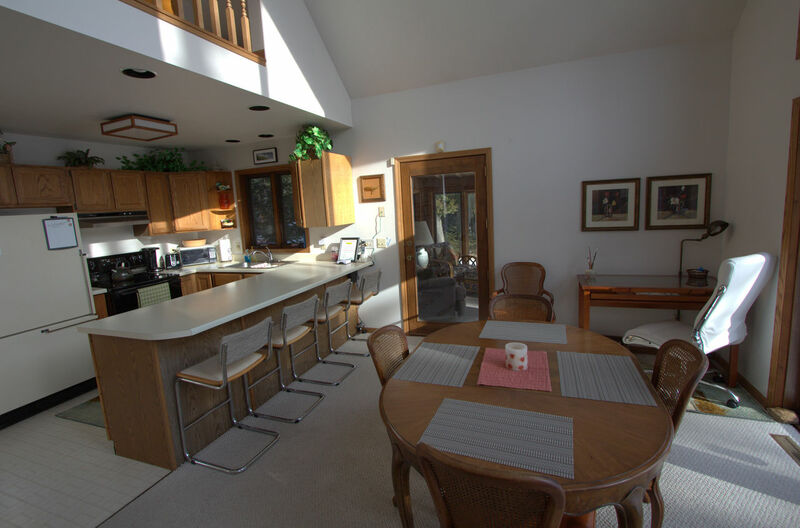 The fully equipped kitchen, dining area, and living room offer fabulous views beyond the slightly sloped yard to the vast Lake Michigan waters. You’ll feel like you’re at the ocean – but without the sharks! Watch the ships far out on the horizon, or watch the birds and wildlife right up close in the yard. Brew your morning coffee in our drip coffeemaker, or visit one of the excellent coffee shops in downtown Manistique. The sandy shoreline and beach change from day to day, so if you stay a few days, you’re sure to experience the many changing moods of the lake. 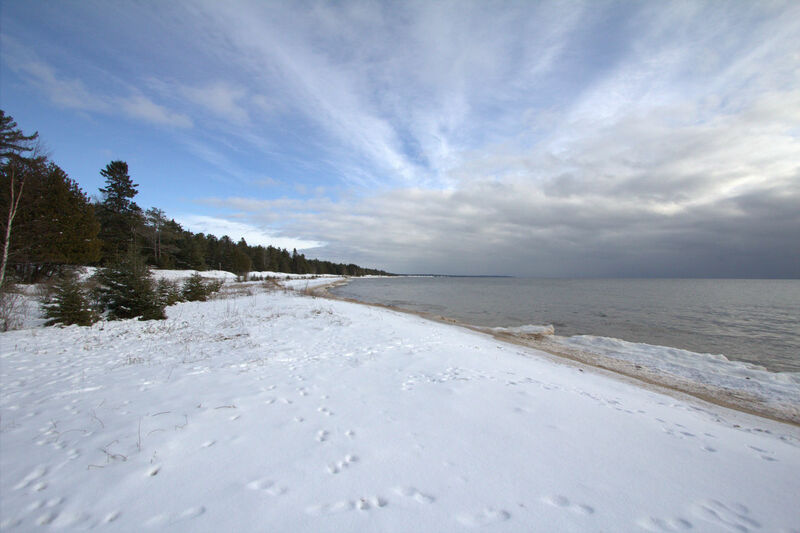 Depending on water levels and changing weather conditions, the beach can be transformed from a short sandy sliver to a wide “ocean-like” beach. The lake can be a tempest of crashing waves or a peaceful sheet of glassy calm. Each day will surprise you with a beautiful gift from nature’s bounty, and it really is a new experience every day. A small stream runs into the lake just to the west of the cabin and provides a great place to explore. Get creative and pick up a few small rocks to paint at North Shore Retreat's "art corner". Stay warm and toasty in the wintertime with gas heat and the option for a fire in the wood burning stone fireplace. 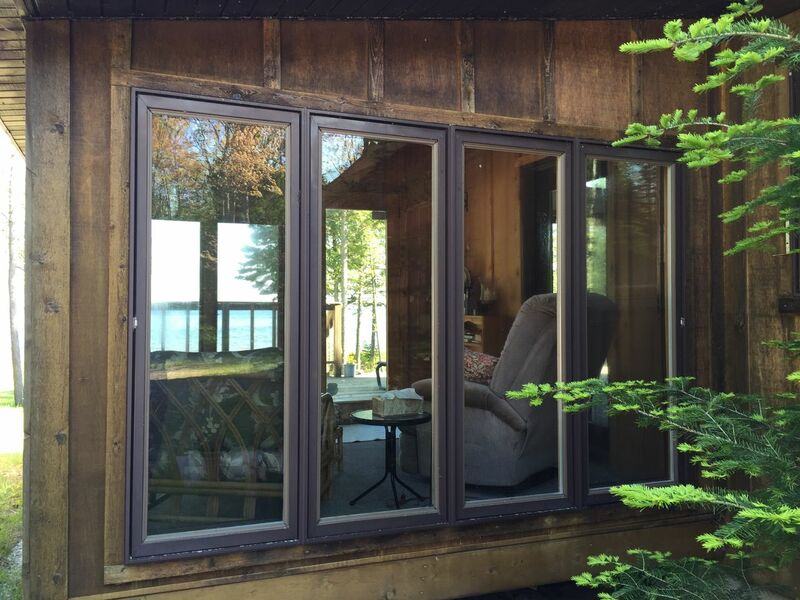 In the warmer months enjoy the wonderful breezes coming in off the lake. 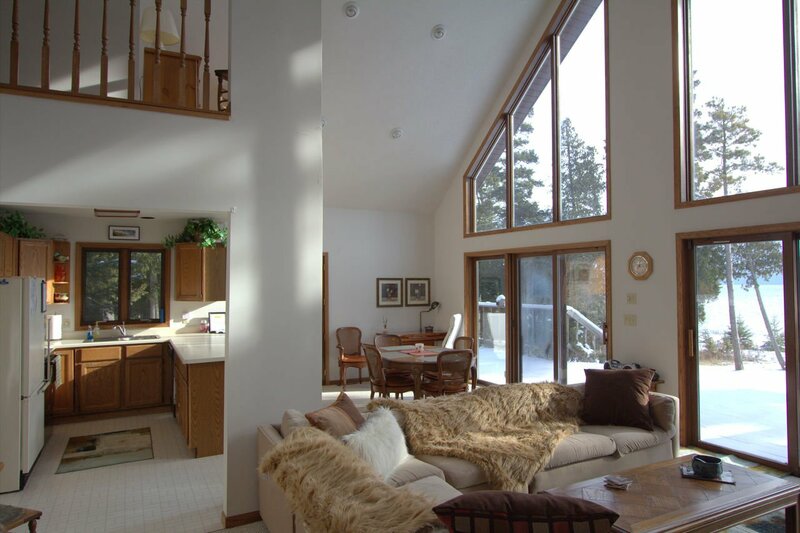 There is no Air Conditioning at North Shore Retreat at this time, but open windows, fans, and the cooling lake breezes typically keep the home within a very comfortable temperature range. Our guests also enjoy fires in the beach front fire ring - enjoy the experience, but please don't ever leave a fire unattended! A propane grill will get your small family fired up for some great meals. If you bring your well behaved four-legged friend, there is a fenced in area behind the garage. 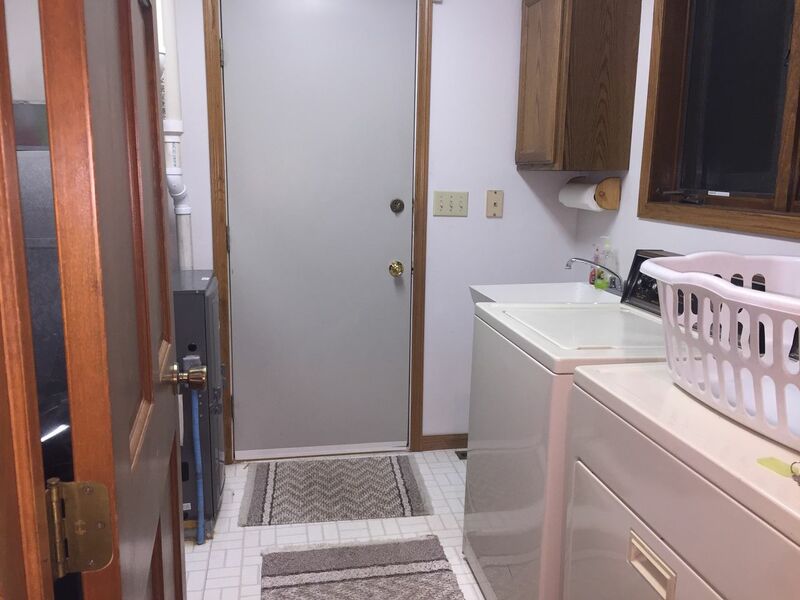 North Shore Retreat provides lots of games for you to enjoy, and a fully equipped laundry room if you need to wash clothes. 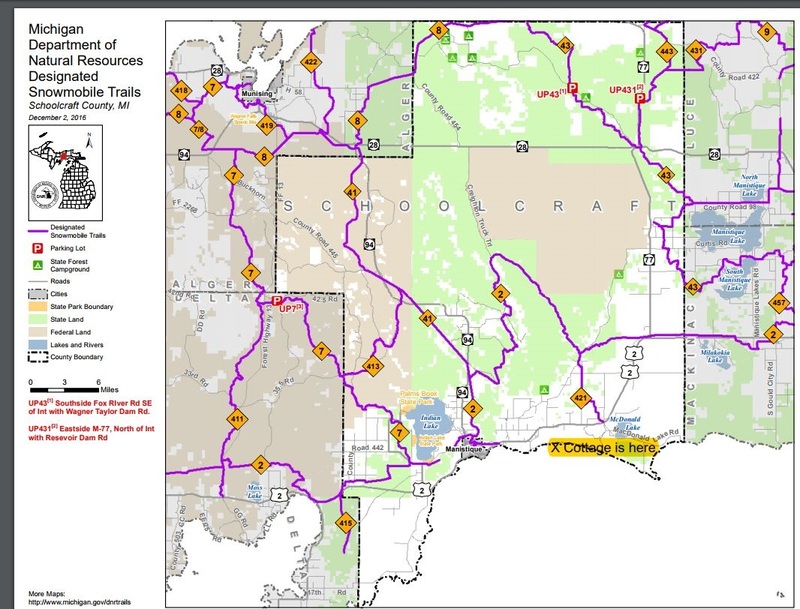 There are many groomed snowmobile trails in the Manistique area - along the Manistique River and through scenic forests. 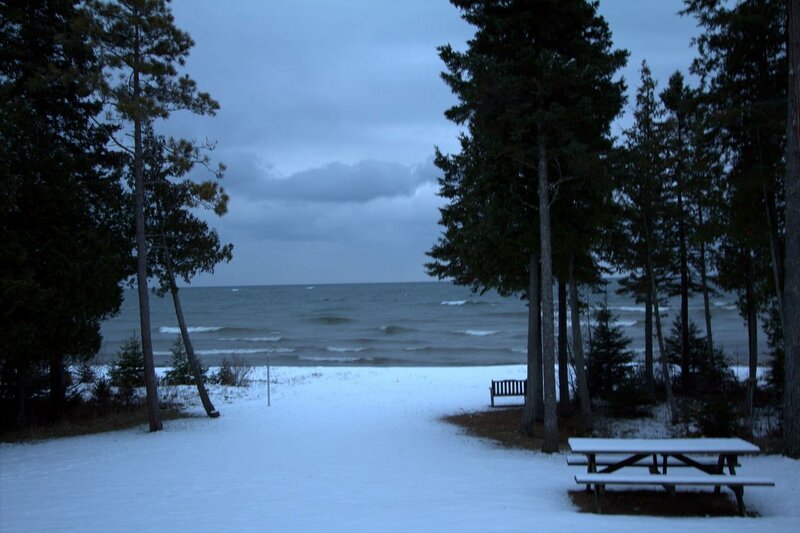 There are approximately 2,000 miles of groomed trails winding through the U.P. If you enjoy hiking, you're welcome to explore our 10 acres, or head out to some of the best hiking trails in the state at nearby Indian Lake State Park, Fox River Pathway, and Ashford Lake Pathway, to name just a few. The Kewadin Casino is close by and will pick you up at the cabin and return your group (of at least 4) as well. Unique day trips are popular with all of our guests. Enjoy a visit to Pictured Rocks National Lakeshore, Tahquamenon Falls State Park, Mackinac Island, and many other incredible places in the U.P. There are plenty of opportunities to canoe, kayak, fish, bike, and explore a variety of other nearby recreational opportunities in the U.P. 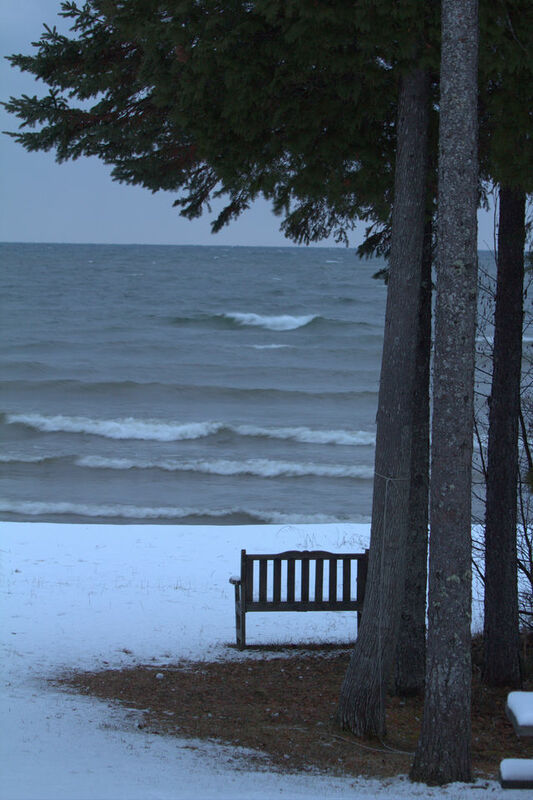 Security Cameras: Due to the secluded nature of North Shore Retreat, we use “smart cameras” to monitor the property entrances, temperatures, etc. when the property is unoccupied. The two outdoor security cams must be left on at all times. We understand that guests may be uncomfortable with the indoor camera being active during their stay, so that camera is set up on a separate module and can be disabled by unplugging the control module from the wall while you are here. Bedroom #1 (upstairs in an open loft): King size bed. Big Springs "Kich-iti-kipi": Michigan's largest freshwater spring. Two hundred feet across, and 40-feet deep. Over 10,000 gallons a minute gush from fissures in the underlying limestone at a constant 45 degree Fahrenheit. By means of a self-operated observation raft, visitors are guided to vantage points overlooking fascinating underwater features and fantasies. Ancient tree trunks, lime-encrusted branches and fat trout appear suspended in nothingness as they slip through crystal waters far below. Clouds of sand kept in constant motion by gushing waters create ever-changing shapes and forms, a challenge to the imagination of young and old alike. Indian Lake Golf Course: A very popular, 18-hole golf course along Indian Lake. Just 5 miles from the Cabin. The Kewadin Casino: It is approximately 10 minutes (7 miles) from the Lodge. 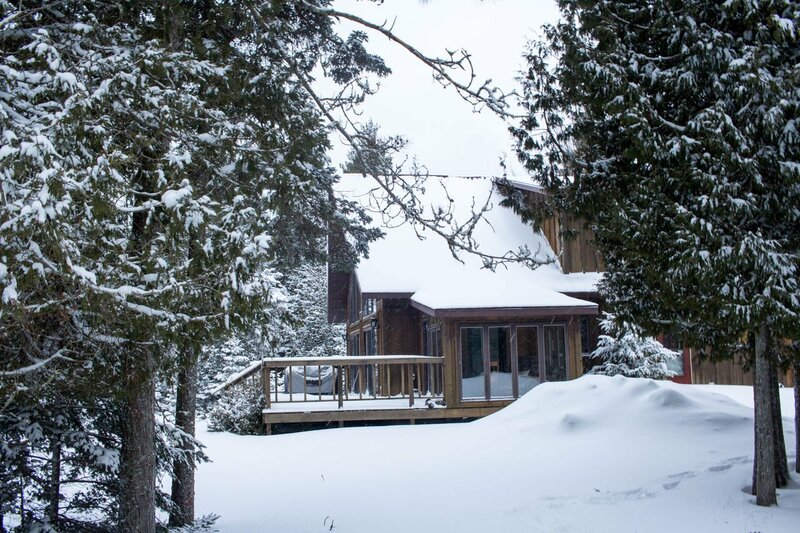 If you make reservations, they will pick you up at the cabin and return your group as well. Historic Manistique Water Tower: The Old Water Tower is one of the many historic sites in Schoolcraft County. Built in 1923 and constructed in the “Roman revival” style, it is also listed in the national register. The renovated building will provide space for arts related public events and public rest room facilities while preserving one of Manistique's unique and historic buildings. Fayette State Park & Historic Town site: Fayette was once one of the Upper Peninsula's most productive iron-smelting operations. Located on the Garden Peninsula at Snail Shell Harbor. When the charcoal iron market began to decline, the Jackson Iron Company closed its Fayette smelting operation in 1891. It is now a completely restored village including 22 historic buildings, museum exhibits and the visitor center, which can be toured May through October. The historic site is located in Fayette State Park. Mackinac Bridge- approximately 1.5 hours away. Pictured Rocks National Lakeshore- approximately 2 hours away. Tahquamenon Falls State Park- approximately 1 hour 30 minutes away. Wow! Wish we could give this place a higher rating! It was nothing short of incredible. 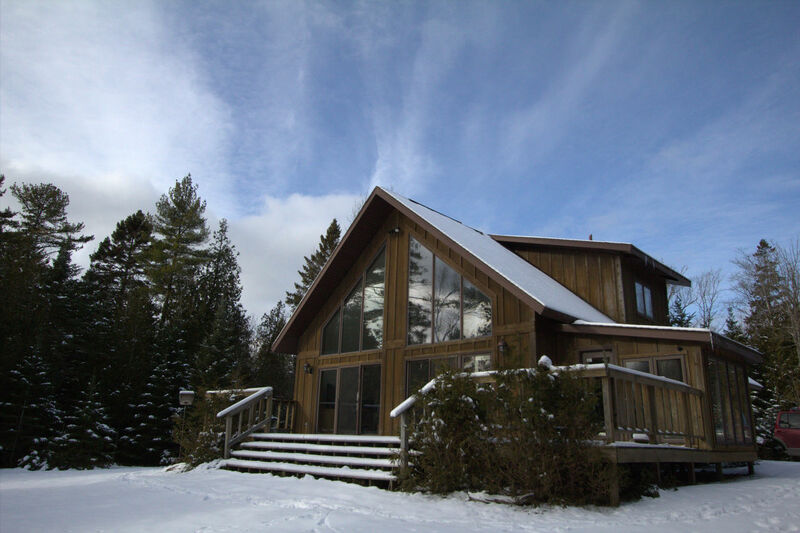 It is in an absolutely beautiful, secluded, pine filled property. The lake front is right out the back door! If you are looking to get away from it all, this is the location to make that a reality. We visited in the winter. We really enjoy being outside in the snow. The dry, powdery snow was breathtaking! We were treated with an ice storm that coated the trees with crystals. It then turned to snow to really make for a truly spectacular scene. This location is less than two hours from many interesting locations. The Fayette Historic Site is really incredible. Of course, sunrise and sunset at the lighthouse should not be missed. If you are there in the winter, head up to see the Eben Ice Cave. If you love photography, this would be a fantastic place to see the stars if the sky was clear. Little to no light pollution at this location and lots of things to photograph. 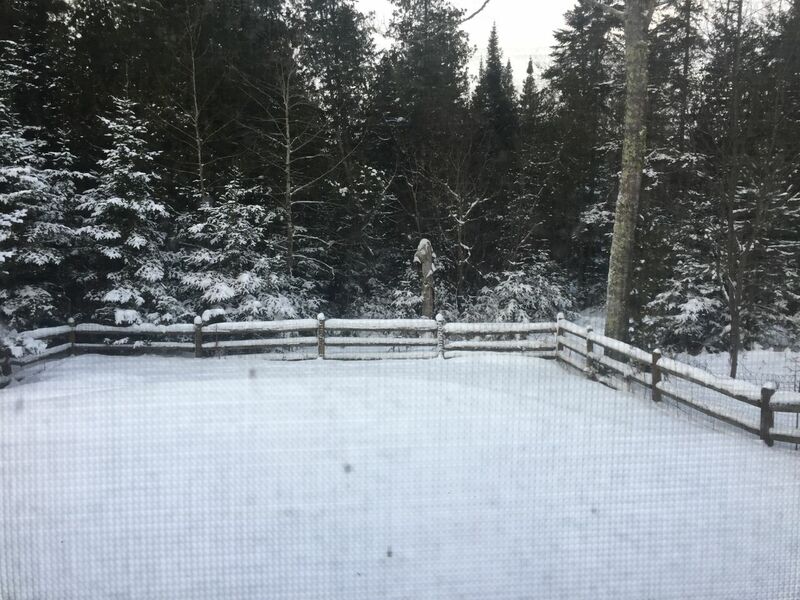 We had deer pass through the property right out the picture window! We have stayed in almost 20 different VRBO locations across the USA. This one truly was one of our favorite locations. The host had everything you would need to prepare meals and store leftovers. We have been in locations where you were given one roll of toilet paper and one roll of paper towels for a week long stay. This location had ample supplies and if you needed more, the extra items were in a closet for you to grab. They really have gone the extra mile in securing items to make your stay comfortable. I loved how it was decorated. It is very pretty. It really feels like you are staying in a home away from home. Lots of personal touches throughout the home. The owner did a wonderful job of making us feel welcome. We are really looking forward to returning in the fall. I want to bring my adult children up to see the beauty of this part of Michigan. We loved it and can't wait to share it with others. If this site is available, book it! It is perfect!! Donna, wow, your review blew us away! We love when our guests appreciate our properties as much as you did North Shore Retreat. 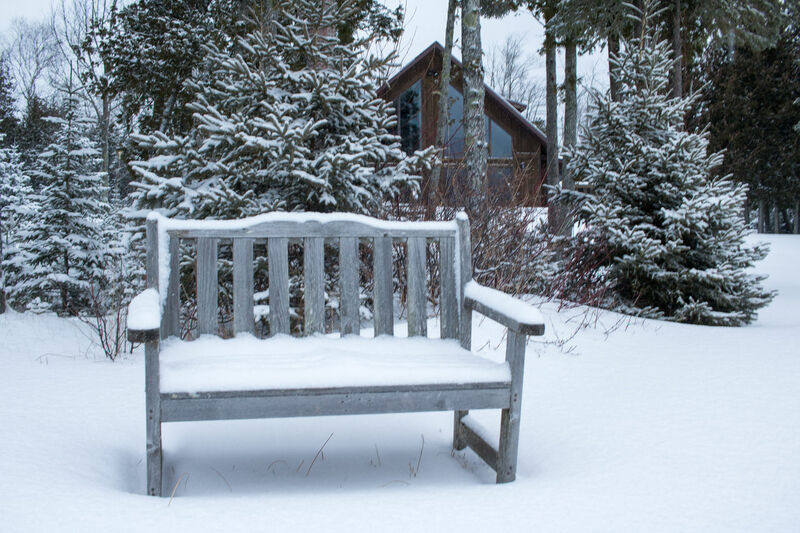 We agree that it is a very special place, no matter which season you are there. The chateau style is absolutely enticing. We are looking forward for your return visit in the fall! 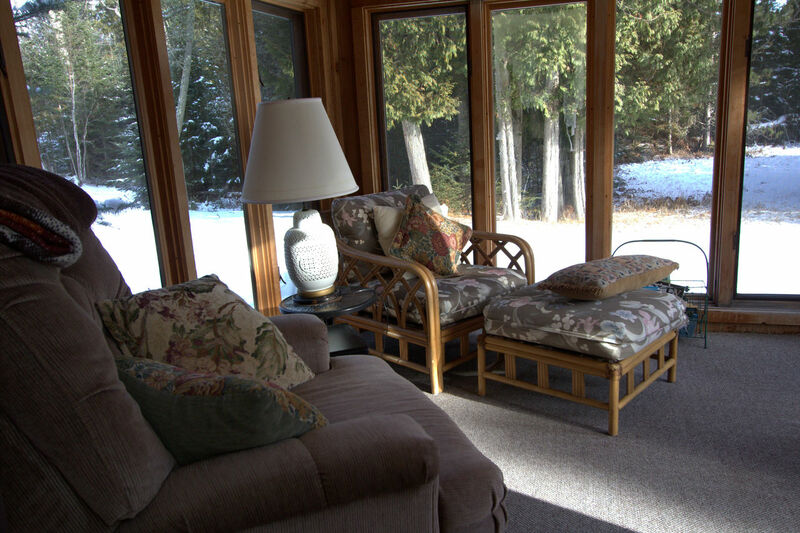 Jodi, we are so happy that Northern Lake Michigan Getaway was what you were looking for in your vacation cottage. We agree that the view is incredible! We hope to see you again soon. This is a wonderful place. 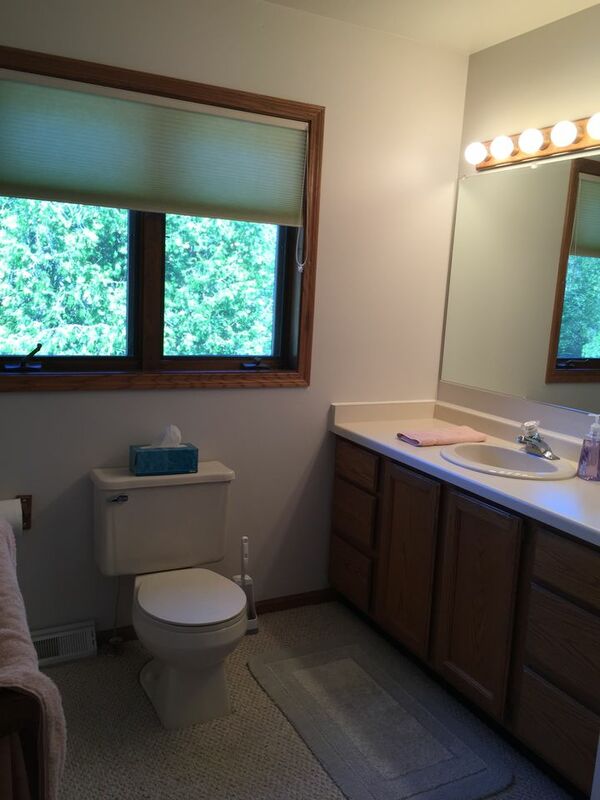 The Cabin was very clean and is very well equipped. The location and the views are awesome. It is very peaceful and a great place to relax. It is also close to Town in case you need to buy groceries. Our dogs had a great time as well. Thank you for letting us stay in your great Cabin. We definitely are planning to return. Dieter, we are so glad that you and your pups enjoyed your stay! 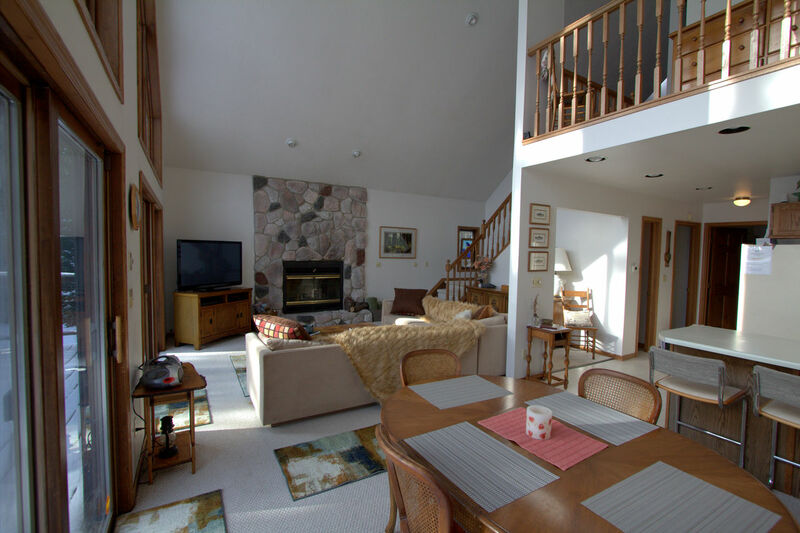 Northern Lake Michigan Getaway is such a great property. And talk about privacy! 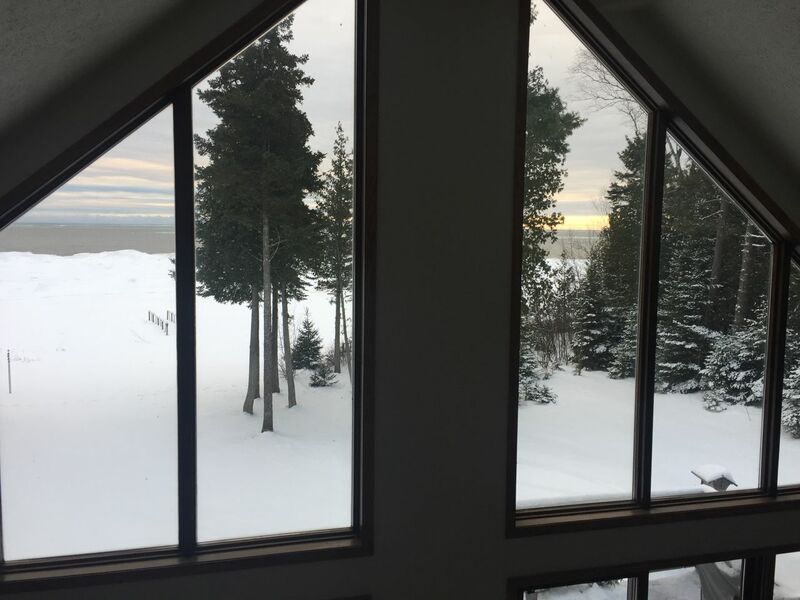 All the windows in the front of the cottage make looking out over Lake Michigan pretty much magic. We really look forward to seeing you again and as a returning guest, you will get a 10% discount. My husband and I stayed for seven days at this lovely house. We loved how private it was and we were really impressed with the house itself. It just what we had hoped...well equipped in every way. 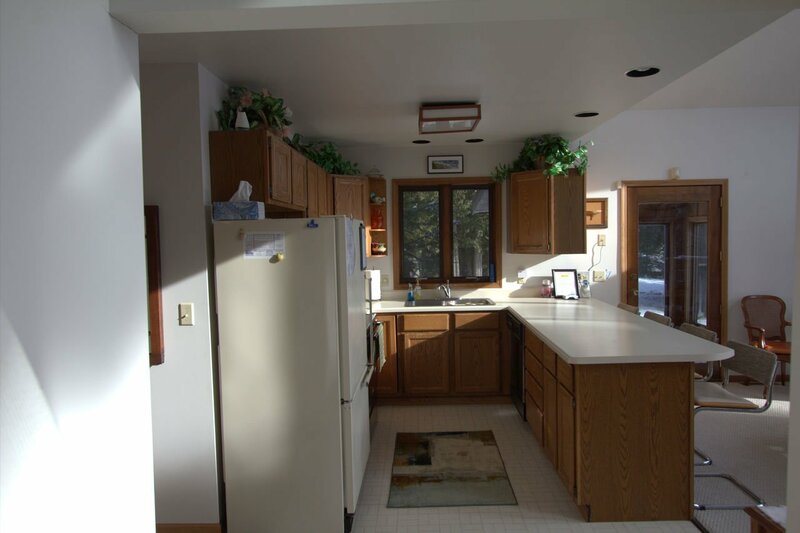 In fact, it had one of the best supplied kitchens of any house we have ever rented. The Lake and the view were beyond expectation. Thanks so much. 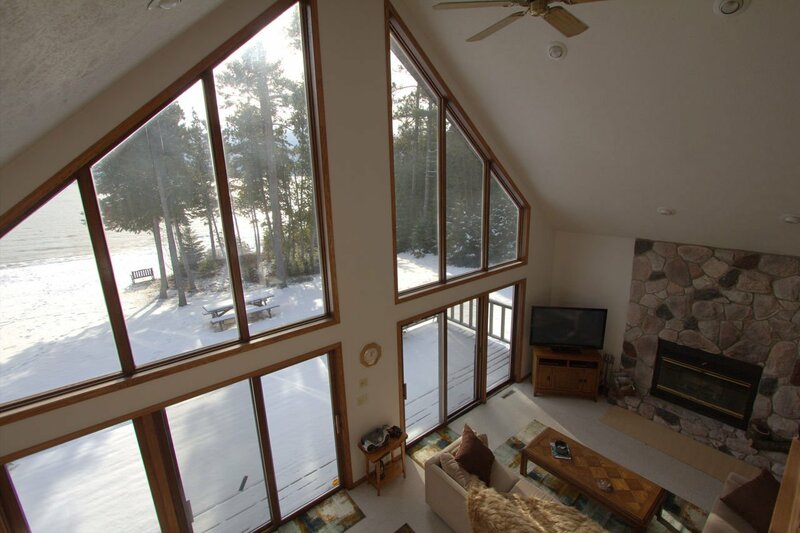 We are so happy that Northern Lake Michigan Getaway fulfilled all of your expectations. A well supplied kitchen always makes for a better stay in my book! There is nothing quite as relaxing as looking out over the water. We hope that you come back again, and remember that we give a 10% discount for returning guests who book through us. This was our third time staying at this wonderful home. My husband and I and our 2 granddaughters spent 3 nights at this peaceful retreat. 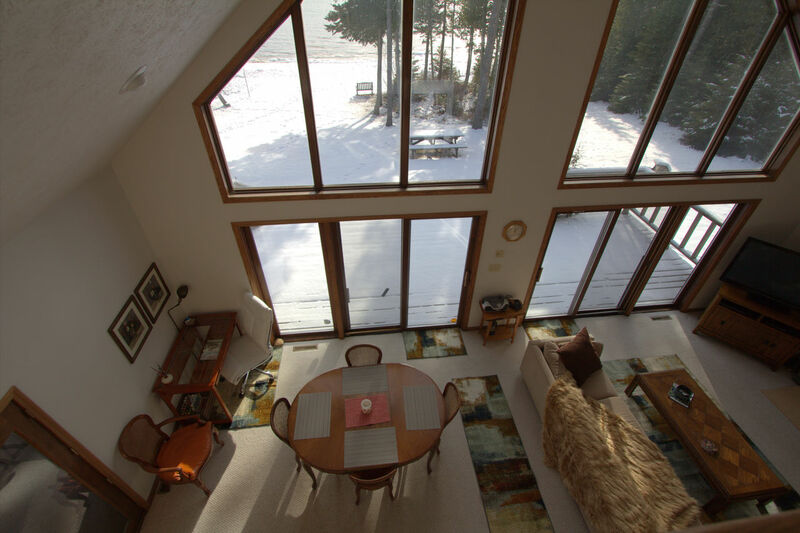 The huge floor to ceiling windows brings the outside in so we could enjoy the awesome views of Lake Michigan and the deer wandering around the yard. 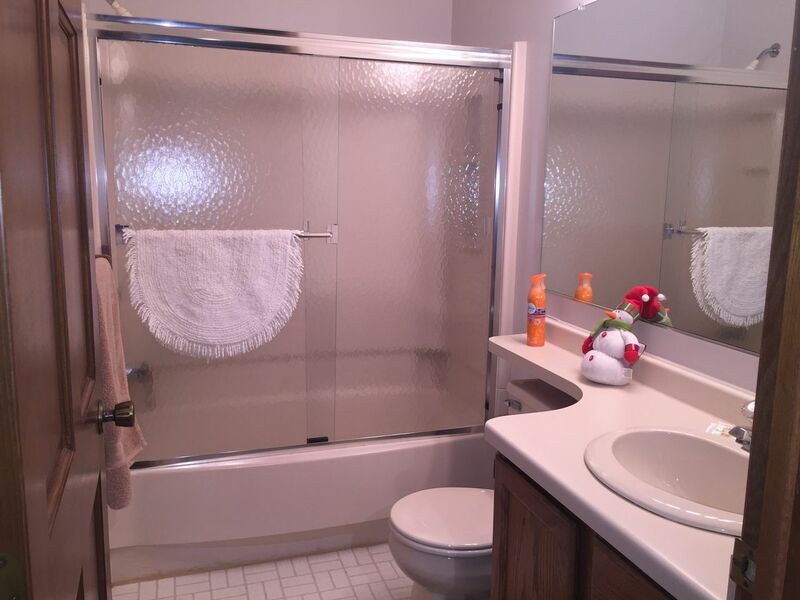 The home is immaculate, has everything you will need and is spacious yet cozy at the same time. We would definitely recommend this beautiful vacation home to anyone wanting gorgeous views, total privacy and a relaxing getaway. Thank you so much for your great hospitality!! We will be back!! Hi Kathleen, we are so happy to have you back for the third time and even happier that you enjoyed your stay so much. What lucky granddaughters you have! Please keep in mind that have we have over 70 properties for you to choose from, and, as you well know, we give a 10% returning guest discount when you book directly through us. We hope to see you again soon. We loved this property from the moment we walked in the door! We drove 5 hours to "get out of town" and to enjoy some of the UP. We had never rented a property from these owners and did not know what to expect. I read all of the reviews and had a question on the last one I saw was written. 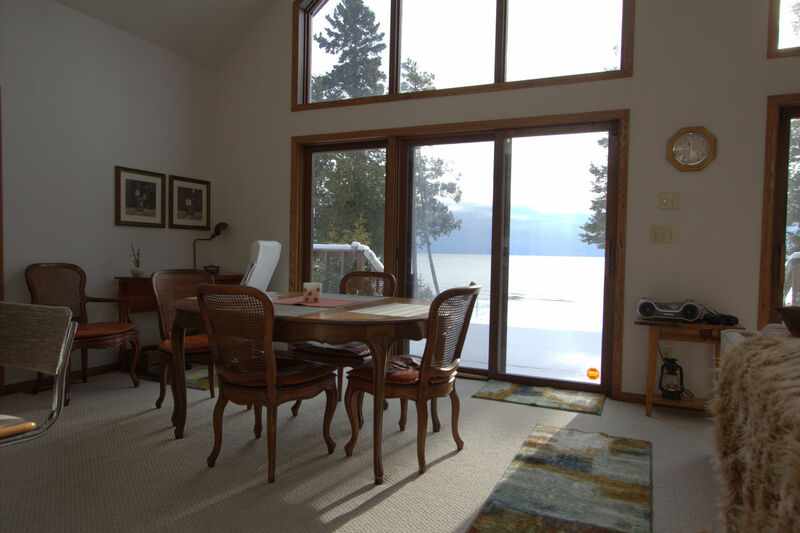 Cara @ Freshwater vacation rentals addressed my questions within the hour and immediately my mind was at ease. We booked the property initially for 4 nights but ended up adding an additional we loved it so much. The location could not be beat. You will see the sunrise and the sunset here. Deer are in the yard multiple times per day and the squirrels are running about. There was total peace here. We did not even hear a vehicle drive down the road! Coming from the city, we were thoroughly impressed. We brought our fur baby, Rudy, along as well. The house inside was immaculate! I could not have cleaned it better myself. All the amenities were there that you could possibly need to feel like you were at your own home- in my case, there were MORE amenities than my home! It was the perfect retreat from our busy lives and I was able to get some beautiful photographs of the area and also do some Art while I was there. You will NOT be disappointed! We definitely will be back! 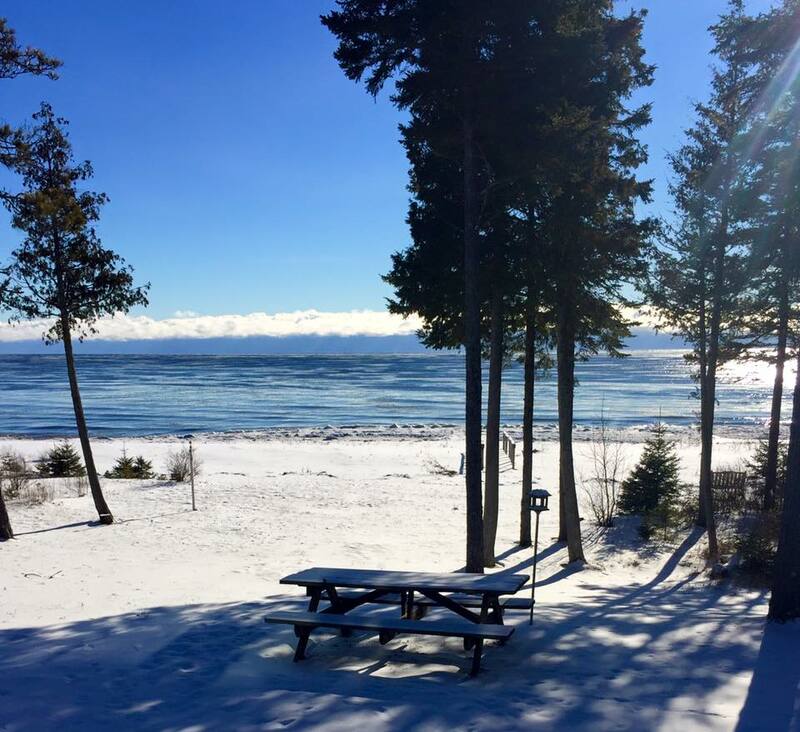 We are so glad that you had such a great experience at Northern Lake MIchigan Getaway. There is nothing like getting out in nature and still having the comforts of home. We have over 70 properties for you to choose from, and we give a 10% returning guest discount when you book directly through us. We hope to see you again soon. We vacationed at this lovely beach-front home over the Thanksgiving holiday. Our stay was fantastic and the place is exactly as described. The location is very private and secluded; however, downtown Manistique is only a 10 minute drive away if you need anything in town. There is a lot of hiking in this area, which was great to do with our dog. The hosts were also super responsive to any questions we had and were readily available to help us if we needed anything. We would love to come back to this property during the warmer months, as well- the beach is absolutely fantastic. Overall, we would recommend this to our friends and family in a heartbeat. Hope to be back again! This is the 3rd time we've stayed here and we love it. The quiet, the peacefulness, the view. 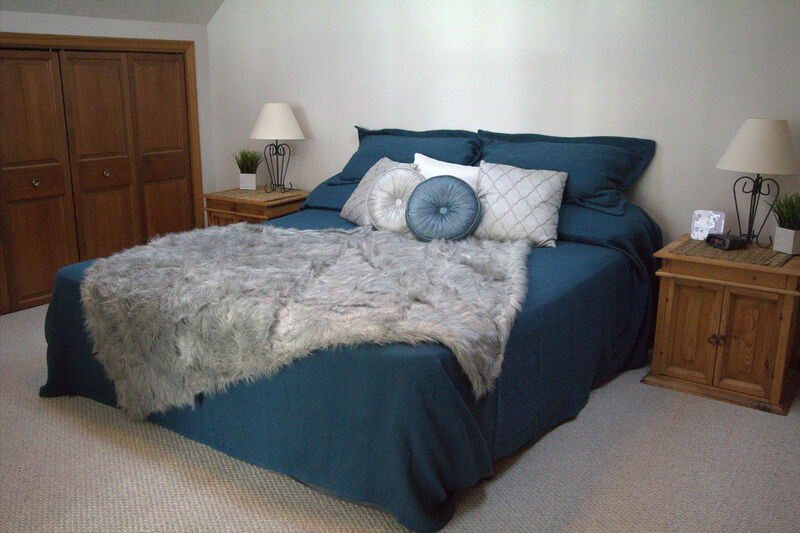 The bed is lovely, the linens are comfortable, the water is hot, the proximity to Manistique is perfect. Thank you so much for everything you do to keep this place so great. We enjoyed our stay. There was lots of things to do for days trips. Pictured Rocks, Bigs Springs, Fayette state park. It was so nice that we could bring our dog,she loved running on the beach. We enjoyed watching the sunrise, and just being able to watch how the weather affects the lake. We would go back . We are glad you enjoyed your stay! It truly is a great location! 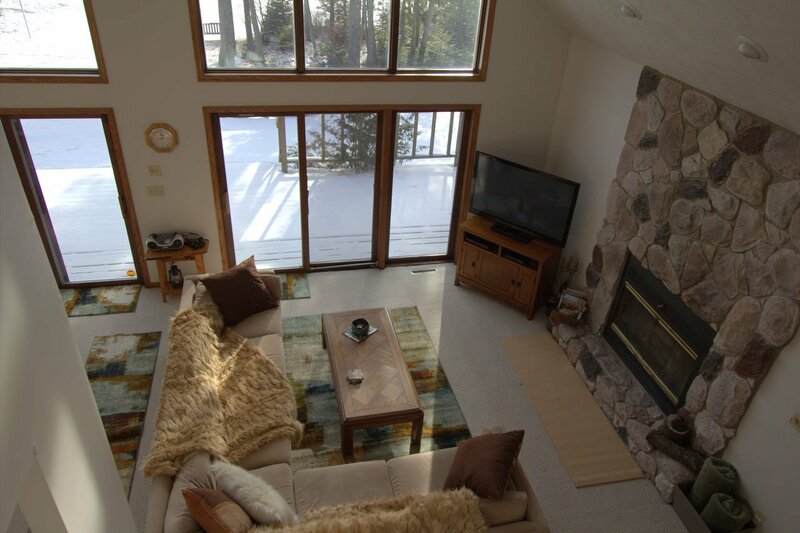 Please check out another one of our 66 Michigan properties for your next vacation! Hope to see you again soon! We had a fantastic time and will do it again sometime. We are thrilled you enjoyed your stay with us. We hope you do book again in the future. Remember, we have 60 properties stacked around Michigan; please check out our website to see the newest homes and special deals.